I was recently asked to participate in an Antique Blog, on well…antiques. www.hrantiques.com At first I thought, heck that would be easy, and fun and a great way to promote the passion of Antique & Classic boating. That was a month ago. And to date I have not done one posting. The difficulty has been trying to think of these boats as antiques. Yes I know. We call them Antique boats. But just antiques? For some reason I see a difference between my boat and my dining room table. OK, both are wood, both are from the 40’s, they each seat 6 comfortably, look great just sitting there, and still serve there intended purpose beautifully. The thing is, my boat serves multiple purposes. It’s a boat, a piece of art and most importantly, a way of life. My dinning room table is not a way of life. With everyone running for the hills because of the price of gas these days, it’s easy to think that owning an antique boat is not in the cards. But think for a second. Don’t buy an antique boat to go boating. 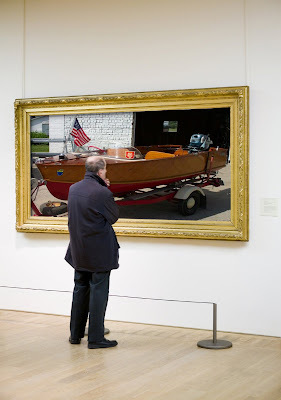 Buy it as art, buy it as an antique, buy it and live the woody boat life style. And every now and then, go boating. If you own an antique boat for those reasons, than the price of gas and the world coming to an end is for weekdays. The weekends are still a great time to live with a smile on your face and varnish brush in your hand…..